The cocktails that make "World's Most Expensive" lists typically include precious garnishes that don't actually taste good, i.e., diamonds, rubies, or an edible gold leaf, which won't buy you a stick of gum once it gets past the esophagus. 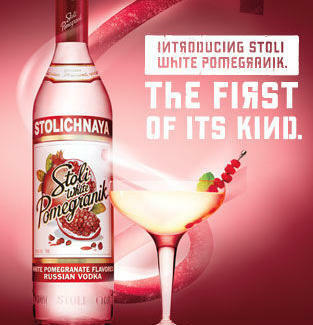 Thankfully there's now a vodka made with a rare and delicious prize: Introducing Stoli White Pomegranik. • 1 1/2 parts Stoli® White Pomegranik™ • 3/4 part fresh lime juice • 3/4 part simple syrup • Shake with ice and strain into a chilled martini glass. • Garnish with basil leaf and pomegranate seeds. For more summer-ready White Pomegranik™ cocktails, visit facebook.com/stoli. If you've accidentally swallowed a diamond, it might be time to visit the World's Most Expensive Surgeon. Unlike the kumquat, the white pomegranate is a beautiful and mysterious fruit. Find out more about its new vodka home at facebook.com/stoli.